Volkswagen’s mini SUV, the Crossfox, is presented as the wild compact off-road vehicle in “Giraffe”, a print advertisement, and “Tigers”, a TV commercial, both set in Africa. 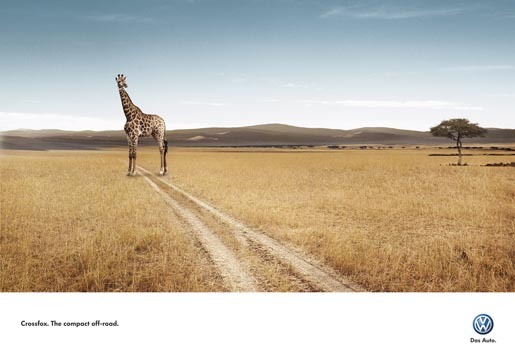 In the print ad a giraffe stands over a well worn vehicle track, suggesting that some vehicle has recently driven right between its legs. In “Tigers”, the Crossfox cavorts through the African savannah as an adopted members of the tiger family only to discover a pack of Crossfox cars. The Giraffe ad was developed at Almap BBDO, São Paulo, by chief creative officer/executive creative director Marcello Serpa, creative director Luiz Sanches, art directors Caio Tezoto, Leonardo Rua, copywriter Renato Simões. The Tigers ad was developed at Almap BBDO Sao Paulo by creative directors Marcello Serpa, Dulcidio Caldeira, Luiz Sanches, creatives Renato Simões, Bruno Prosperi, account team Fernão Cosi, Tiago Lara, Vanessa Previero, Ana Beatriz Moreira Porto, Aline Macedo, Malu de Godoi, and planners Cintia Gonçalves, Fernanda Barone, Renata Bonilha. Filming was shot by directors Pedro Becker and Bruno Vianna via Fat Bastards/Movie&Art with director of photography Hembling Junior, producers Luana Aghata Rodrigues, Gabriel Dagostini. Filming involved two adult tigers, two tiger cubs, and a trainer. Sound was designed at Raw Produtora de Áudio. Editor was Pedro Becker. Post production was done at Fat Bastards/Casablanca. The Tiger print ads were produced by photographer Andreas Heiniger.